LiveU Connect: video central management - cellular newsgathering. IBC2013, RAI Amsterdam, September 3rd, 2013 – LiveU (www.liveu.tv), the leader in portable live video-over-cellular solutions, has today announced LiveU Connect, incorporating the full-range of LiveU’s product portfolio and its next-generation central management system, LiveU Central, in one single multi-layered, multi-faceted live video ecosystem. 1/ Front-end field acquisition cellular bonding products: include the variety of devices and software to transmit live video from the field using LiveU’s patented cellular bonding technology. This includes LiveU’s various backpacks and camera-mounted units, external antennas, hybrid vehicle solutions, computer bonding software, and smartphone apps. 2/ Back-end servers: LiveU’s server options to physically ingest video in a broadcast facility or on the cloud for online distribution. 3/ LiveU Central management platform that allows full control and monitoring of the entire ecosystem and content via any browser-supported device. LiveU Central brings live video management into the heart of the control room, providing newsroom operators with the most comprehensive and intuitive tools for controlling the operation and flow of multiple live feeds from different locations, both nationwide and overseas. The system includes: LiveU MultiStream, enhanced point-to-multipoint distribution, enabling high-quality live content to be instantly distributed from the field and shared between bureaus and affiliated stations in multiple locations; LiveU Matrix for real-time previews and flexible online management of multiple feeds for live broadcasts and social newsgathering; Geo-Location for each LiveU unit; and Enhanced Remote Control of all LiveU field devices, servers, laptop and smartphone applications, including remotely managing satellite contribution through LiveU’s packs and hybrid solution. LiveU MultiStream, based on LiveU’s robust protocols, allows point-to-multipoint-distribution, enabling the central cloud-based distribution of live HD video over the public Internet with guaranteed high-quality transmission between different sites that have a LiveU server. Video can be sent from one central point to multiple newsrooms or broadcast stations for simultaneous live broadcasts, representing the most cost-effective way for video distribution between separate facilities, compared to dedicated fiber connections, satellite and dedicated IP lines. It also provides a backup for primary feeds. For example: a local station in New York can simultaneously share its live feeds with other stations across the US; a news bureau in one country can share its content with other bureaus around the world. LiveU Matrix offers optimal flexibility for daily newsgathering allowing operators to handle high volumes of content simultaneously via a simple-to-use, intuitive user interface. This dramatically reduces operational complexity and means that operators can preview, monitor, and switch between a large number of feeds to any output (SDI, CDN, or other sites) from a central location for dynamic live coverage of breaking news. Users can simply ‘drag and drop’ live feeds from multiple channels on one screen. By using the LiveU Matrix, any user in the control room - or even while at home or traveling - can easily monitor all incoming LiveU feeds simultaneously, allowing users to leverage the full potential of live news storytelling and social newsgathering The Matrix is very useful as a screening tool for major news operations, or, for example, when a large number of simultaneous feeds come in from contributor smartphones via the LU-Smart app. Geo-Location allows newsroom operators to be able to track instantly the location of all LiveU units, providing an accurate location of every device in the organization. This results in faster response times via the better use of resources on the ground. Locations are indicated on a central map showing the current status of every unit, for example live, recording, offline etc. 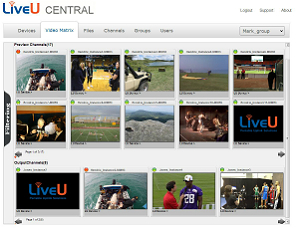 LiveU Central also provides a video preview and management of each device via the map view. Enhanced Remote Control allows any authorized user to quickly and easily control any LiveU device and software from anywhere, whether they are sitting in the master control room or when out of the office. All LiveU devices continue to offer the same direct controls on the devices themselves via touchscreen, allowing maximum flexibility to match the production workflow of the broadcaster. In addition, the MCR is able to monitor connectivity (and the history of connectivity in a given location), and can use that information to switch location or add BGAN/Ka-Sat connectivity if required. LiveU Central integrates with newsroom, CDN and OVP equipment. The system includes other features and capabilities such as managing groups, users and output channels, Store & Forward and FTP. Video can be stored on local storage or in the LiveU Cloud. LiveU developed and patented the technology for cellular bonding for remote news gathering in the US and other countries. All LiveU products are based on this fourth-generation patented technology. The World Economic Forum has just recognized LiveU as a Technology Pioneer 2014. Consisting of 36 companies, the winners comprise what the World Economic Forum has selected as the world’s most innovative technology start-ups. LiveU has also been named one of the 2013 finalists in the 6th annual Mobile Excellence Awards in the Best Technology Breakthrough category for its smartphone technology. LiveU is presenting its full range of live video uplink solutions at IBC2013, RAI Amsterdam, Sept. 13-17 (Stands 3.A63 + 3.A68). LiveU has been nominated for two IBC Connected World.TV Awards for the Innovation Award and for the Best Delivery Technology of the Year (Services).